2018 has been a big year for mergers and acquisitions in India. Bloomberg Reports show an investment of USD 100+ Billion and being bigger than 2017. While deals like Vodafone Idea and Walmart Flipkart have been the poster children of 2018, the year 2019 is slated to see USD 100+ Billion. We see several factors favouring more and more mergers and acquisitions in India. The dealmakers rightly emphasize on the financial due diligence of the companies and leave the function heads to review their respective areas and draw up the transition plans as required. In the process, people function though a critical building block of the business does not get its due attention. Cultural differences, communication gaps, delays in redesign of the organization and lack of clarity in defining organization’s strategic priorities are the most common root causes behind a bumpy transformation. The processes deployed and the attention given to this transition has a huge bearing on the outcome of this investment. An HBR article says, 70% to 90% of the mergers and acquisitions fail. That’s scary! How can we make this work well? 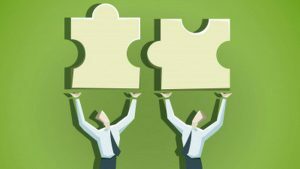 M&As are often a long-drawn process subject to several approvals of a range of stakeholders right from Government bodies, financial institutions to shareholders and lenders. The process brings in its own uncertainties, anxieties and challenges to the fore. Hence, rumour mills in the organizations work overtime fuelling the anxieties and creating more and more dark clouds in the horizon. The leaders have an important role in clearing the air. Ideally, they have to communicate the facts as much as possible and keep the rumour mills quieter. They do their best to conclude the financial deals as quickly as possible and at the earliest moment thereafter have to swing into the action of forming a task force that brings experience, knowledge of the entities and carry the trust of people across the rank and file. The leadership team has to define the broad contours of the transformation such as the vision, the strategic priorities and the principles to be followed in dealing with the differences that come on the way. Many a times, these are not defined adequately and the task force is asked to play it by the ear and act appropriately. In organizations of large size, this becomes a problem hard to deal with. It calls for patience, experience and imagination of the senior management to be able to think through various situations and show the courage to work out the details. They need to study the organizations coming together, the values, their journeys, aspirations and context. The norms and ways of doing things could be very different in the two entities. The acquirer must not impose their way of doing business on the organization getting acquired. There must be adequate room to learn from one another and develop altogether a new way of life. This is a critical step in the transformation process, must be owned by HR and co-anchored by the top leaders of the organization. There are cases where the taskforce communicates offline as well as online. Town halls, e-zines, webcasts, chats and so on are hosted by the senior leaders. Yet the integration process does not go well sometimes because the communication does not percolate down consistently and the leaders across the hierarchy do not speak with the same conviction and fervour as the top leaders do. It is hard work and has to be done by the leadership team. They have to do their best to align the leaders of the new organization with the new purpose, introduce the new vision and ways of doing business. They have to empathise with the people who turn redundant as a result of the M&A process, communicate proactively about the layoff process and the possibility of any further layoffs. They have to outline the development plans for the new entity. All of these steps are critical to the success of the M&A process. Role of HR is critical in each of the steps of planning and communication.